CAD Forum - How to set bitmap transparency in an Inventor drawing. If you use raster images in title blocks or in other parts of DWG/IDW Inventor drawings (e.g. for your company logo, facsimile of your signature, photo, etc. ), you may need to set your picture transparent. Images are inserted as skech symbols. The transparency of bitmaps in sketch symbols can be set in the symbol editor - in the browser tree, at the symbol definition, choose Edit, right-click on the raster image and choose the function Image Properties. In the "Image Properties" dialog then select between the options "Not transparent", "Use Mask" (select the "transparent color" - the Chroma Key), or "Use Image Alpha" (the standard transparency property for GIF and PNG images). Then finish the symbol editing. 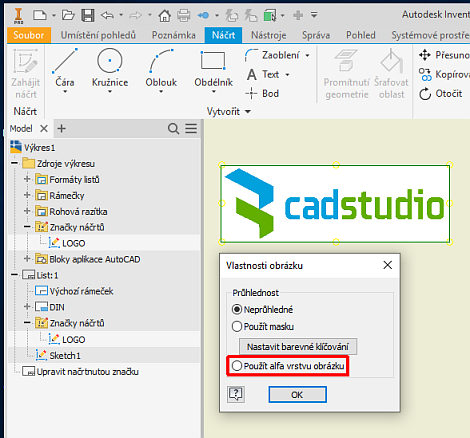 Tip 11953: How to save PDF/A-1a archive from CAD software AutoCAD, Inventor, Revit? Tip 11835: Shared Views to your DWG drawings - easy collaboration with collegues and clients. Tip 11570: How to create an Inventor drawing from a photo? Tip 9647: PDF print error - cannot print document. Tip 9435: Saving an Inventor drawing as an image (background, resolution). Selected tip: Autodesk Accounts offers only "Install Now". Why? How to change truecolor DWG objects to indexed ACI colors? « | » How to erase a specific object type in all DWG layouts?